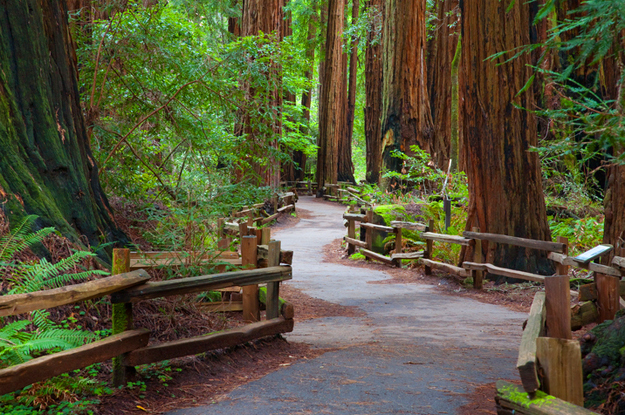 Ancient Muir Woods National Monument is a natural wonder. Stepping into the quiet of towering redwood trees, with streaming rays of sunlight or ethereal fog filtering through them, is awesome. Once inside the entrance plaza to Redwood Canyon, only 16 miles north of bustling downtown San Francisco, the real world disappears. While the National Park is always filled with visitors, a respectful silence happens. Voices become muffled. The pace slows. It’s epic – just you and thousands of old growth Coast Redwoods, the tallest species of trees in the world. How Did This Pocket Of Ancient Trees Survive? The Coast Miwok people were the first to inhabit this area of California. They fished estuaries and hunted in forests. However, it appears they left the dense, dark redwood forest alone. According to Miwok myth, little people with the power to drive humans crazy living in the redwood forests. The Spanish, who first settled in the Marin County area in 1817, left the dark forest alone, as did English immigrant, William Richardson who obtained it through a land grant in 1838. The Gold Rush changed everything. The Bay Area felt the crush of people whose food and shelter needs to ravish the natural resources, including timber. Between 1840 and 1870, most of the area’s timber, including accessible redwood stands in Marin County, was logged. Muir Woods’ magnificent giants were spared due only to their inaccessibility. In the late 1900s the forest of 400 to 600-year-old redwood trees, including one recorded as old as 1000 years, was again under threat. This time it was encroaching population growth. A local conservationist and politician, William Kent and his wife, Elizabeth, purchased Redwood Canyon in 1905. The land came under threat once more in 1907 when a local water company wanted to flood Redwood Canyon for a reservoir. Kent outplayed them by donating the land to the federal government, who declared it a National Monument in 1908. As more and more visitors flock to the magnificent redwood groves, increased restrictions have been imposed by the National Park Service to safeguard and conserve these natural treasures. Why Do Coastal Redwoods Grow In Redwood Canyon? Today, Coast Redwoods, belonging to a family of coniferous trees called Cupressaceae, are restricted to Redwood Canyon and small stands along a narrow, cool coastal belt from Big Sur to Oregon. These locations provide a combination of moisture and soils the giant trees need to survive and grow to maximum size. In 559-acre Muir Woods, Coast Redwoods thrive along the alluvial flats of Redwood Creek, where flooding and silting occurs. In times of drought, needed moisture comes from fog drips. The tallest tree in Muir Woods is almost 260 feet high; the widest is 14 feet in diameter. The tallest tree in the world is currently a redwood over 379 feet located in an inaccessible area in northwestern California. This majestic place is great and accessible for all ages. The main route has 3 popular trails. The first two are lower, flatter, paved or boardwalk trails along Redwood Creek and over low foot-bridges. Each is gorgeous, doable for anyone, and effortless for strollers and wheelchairs. The 3rd is more challenging as it veers off for an upward climb along unpaved Hillside Trail. Active kids love this adventure! Maps are available at the Visitor Center and signpost maps and information along the way explain natural sights. Begin at the entrance for a gorgeous walk along the west side of the creek to Bridge 2. Continue over the bridge for the walk back on the east side. The widest tree in the park is near Bohemian Grove, between Bridges 1 & 2. Begin at the entrance for a walk along the Creek to Cathedral Grove. Walk the loop through Cathedral Grove, back to Bridge 3, cross the creek for a walk back on the other side. The tallest tree in the park is between Bridges 2 & 3. From the entrance, walk along the creek to Bridge 4. Cross the creek and walk back along unpaved Hillside Trail to Bridge 2 for a walk back to the entrance on either side of the creek. Serious hikers can hike many unpaved trails extending into Mt. Tamalpais State Park. Whichever way you choose, it’s a glorious walk through the forest and an awesome sensory experience. The sheer size of the trees overhead is beyond imagination. Experiencing rays of light shining through the trees on a sunny day or layers of marine fog drifting around them on a foggy day is ethereal. Despite the muffled footsteps and sounds of visitors, you can hear the soft, rhythmic sound of Redwood Creek and wind rustling through the giant trees and those in the under-story thriving in light gaps. Getting to Muir Woods is a challenge. Thousands of visitors flock there daily. It’s crowded most of the time, especially in peak summer season. No vehicles are allowed in the park. Parking is limited to a small area outside the entrance, and too many people drive. The road to the park is narrow, winding and steep, stressful for anyone unaccustomed to mountain driving. Even if you get there before it opens at 8 am to queue up for a spot, spaces are limited. Most who drive have no choice but to park their cars along the roadway and walk a long way to the entrance, adding to the confusion and congestion. Trusted Tours & Attractions offers two narrated sightseeing tour bus tour packages at discounted prices that include Muir Woods. Both offer hotel picks up in the central San Francisco area. Grayline’s Muir Woods & Sausalito Sightseeing Tour is a 3.5-hour experience that includes a spectacular ride over the Golden Gate Bridge, time to walk through Muir Woods, and a visit to picturesque Sausalito. Their San Francisco Deluxe City Tour with Muir Woods & Sausalito is comprehensive 8-hour tour hitting the best of San Francisco landmarks, neighborhoods, and sights, including a stop at Twin Peaks, and a stop at Vista Point for panoramic Golden Gate Bridge views before driving over the magnificent bridge to Muir Woods. After exploring the redwood forest along the main trails, it’s off to artsy Sausalito. See the sights and lose yourself for a time in the beautiful natural beauty of this “surreal” primeval forest. Some say it’s like being transported into the idyllic land of Hobbits!